Mr. Gary L. Baker was born July 19, 1946 in Scottsbluff, Nebraska. He was Baptized into Christ in 1957 and Confirmed in the Lutheran Faith in 1987. He graduated from High School in Scottsbluff, Nebraska in 1964. He has three degrees from the University of Nebraska, none of which has made him any smarter. In 1986 he married Debra R. Daberkow, West Point Nebraska, He has one son, Torrey J. Baker, a Chief Warrant Officer 4 serving in the Nebraska National Guard. In 2006 Mr. Baker retired a Lieutenant Colonel with 37 years of Active, Reserve and National Guard Service. He is a Vietnam Veteran and a past Reserve Component Senior Instructor, Command & General Staff College, Ft. Leavenworth, Kansas. In 2014, he retired from the Lincoln (Nebraska) Public Schools with 24 years of service. 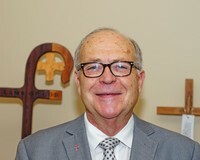 Mr. Baker is a member of Good Shepherd Lutheran Church, Lincoln, Nebraska serving as Chairman of the Board of Elders, Stephen Ministry Leader, and Church Council Member. He previously served as Co-Chair of a successful Capital Campaign and recently retired from the Finance Committee. He has been a Lay Delegate to the ACELC since its inception. He currently serves as Conference Chairman for the ACELC.